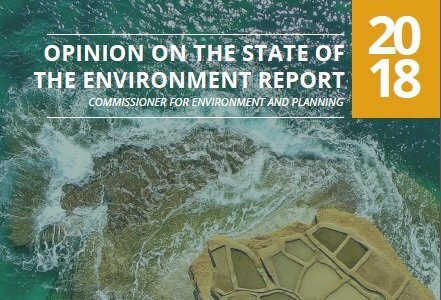 Opinion and Recommendations by the Commissioner for Environment and Planning on the State of the Environment Report 2018. The Commissioner for Environment and Planning within the Office of the Ombudsman, Perit Alan Saliba presented to Parliament his opinion on the State of the Environment Report 2018. The State of the Environment Report is published by the Environment and Resources Authority (ERA) every four years in terms of the Environment Protection Act. In his introduction to the Opinion, the Commissioner stated that the quick developments we are experiencing today, with regard to economic aspects and our standard of living, although positive, also have a negative side as the level of environmental protection is not growing at the same rate with that of our economy. The Commissioner emphasised that the environment advances should, at least, be at par with the economic development. In this respect, the Commissioner presented recommendations and proposals aimed for discussion. The first proposal concerns the protection of our countryside, in other words, the outside development zone (ODZ). The Commissioner said that it no longer makes sense that the authority responsible for planning decides on ODZ proposals. He recommended that ODZ should be protected and hence ERA should take this role after it becomes well equipped for this eventuality. It is illogical that for certain ODZ proposals the ERA objects and the Planning Authority approves. The second proposal relates to the construction industry, which is experiencing a fast phase, signalling the need for micro-planning, rather than macro-planning. For example, when with one single policy, the height limitation around the islands is raised by at least one floor, the authorities should come to citizen level and specify a master plan for each area, or even for each block surrounded by four roads. Such a procedure would provide for buildings that make the most efficient use of land, eliminate the significant number of garage doors on our streets while providing a substantial level roof for the collection of solar energy. The third proposal relates to transport. Whether we choose to regard transport congestion as merely an environmental problem, or a much broader national issue that threatens to undermine our productivity and cripple a growing economy, we can agree that this problem calls for an aggressive and innovative solution. The Commissioner suggests that there is an immediate need for a mass transportation system. Maybe one day we will start giving open spaces back to citizens who would like to walk, ride a bicycle or practice sport while breathing clean air and enjoying the environment. The Commissioner argued that there is a lot that can be done, and postponing further is not an option. The State of the Environment Report is based on information from the years 2009 to 2015, which in his opinion, make the report outdated when one considers the development that occurred in the last three years. The Commissioner concluded that we have to start acting as soon as possible, before it is too late.